Conversions: Bed Sheets to Fabric Yardage. Two days ago I had a conversation with my sister Audy (she’s kinda popular around this blog lately, isn’t she?) about using sheets for sewing projects. She is making an owl toddler sleeping bag for a church activity, and told me she thought it was going to cost her about $150 to make. Crazy! I reminded her of all the cute things she could make for $150 and all the new Amy Butler fabric she could buy, and suggested that she use flannel sheets and cotton sheets instead of fabric by the bolt. Then of course we had a long discussion about how many sheets she would need, their sizes, etc. I was thinking about how it can be so annoying trying to figure out the conversion from fabric on the bolt to sheets. Wouldn’t it be nice to just have a chart to refer to instead of using those precious, and in my case, oh-so-few brain cells each and every time? Yes, it would, so I made a chart. As I was making the chart, I kept thinking of more information that could be helpful, so I ended up including all of it. For example, with 45″ fabric you can often get two “lengths” out of the width. If there was under 10″ of extra fabric on the edges (96″ wide fabric would have 6″ of extra fabric since 45″ x 2 lengths = 90″), I didn’t worry about it. 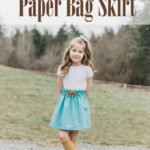 In cases where there was more than 10″ (you can only get one 60″ width out of a king sheet which is 102″ wide so there is 42″ extra fabric), I also included the conversion of actual square inches. That conversion would be helpful if you were making a project with many small pieces, such as a quilt top. Yikes, I hope this chart isn’t more confusing than helpful. The extra conversions come into play mainly for the larger sized sheets. *Another thing that’s important to keep in mind is that these measurements are assuming you are using sheets that are either plain colored or that are multi-directional. 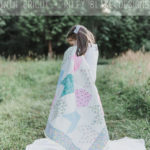 If you are using printed sheets for your project that have a one-way design, you may not be able to turn your pattern pieces sideways to get the most out of the fabric. Make sense? I hope this chart can be useful to some of you, I just learned that thanks to the Swine Flu Audy won’t be needing it anymore. Did you know that to test you for the Swine Flu they put a stick up your nose into your brain? Okay, so it doesn’t actually go up to your brain but Audy said it feels like it does. The doctor actually asked her not to punch him just before he did it. Feel better soon Audy! This is actually going to be really useful! Thanks for taking the time to put it together! thank you so much for doing my math for me! …Seriously! um…you’re amazing. Also, it would be fun to see that owl sleeping bag if Audy does do one or if she got the idea else where. I hope she feels better. that sounds terrible! oh my goodness abby! you are amazing! Ooooh, I will have to remember that you posted this. Thanks for sharing! Thank your for the conversions! I have used bedsheets for a lot of simple projects and for backing on blankets and such. It is so much cheaper to do that when you need lots of fabric. Cool info! Not that I sew but I’m sure the ones that do will certainly find it useful. OK I so did NOT know the tested for swine flu like that! Yowzas! I thought it would be by blood test. Poor her! Found your blog via Craft Gossip and just made some rag edge blankets and they are awesome! I was tested like that for the flu a few years ago and about kicked the male nurse. Warned my husband when he went in later and since I had the flu the tested him for streph, they about gagged him. Wasn’t a fun ER trip. Hope your sis gets better soon. That was soooo helpful! I just love your blog, you have the best ideas. Just a guess, but were you the smartest of all of your sisters? Seriously this chart is amazzzzzzing! Thank you! I wanted to see if buying organic fabric and making our own sheets would be less than buying them made..YES. This. Is. Awesome!!! I actually do like to occasionally use sheets for sewing projects, especially when larger amounts are required like for draperies, duvet covers, etc… This will definitely come in handy, so THANKS!!! Love your blog, your patterns and tutorials are great! p.s. 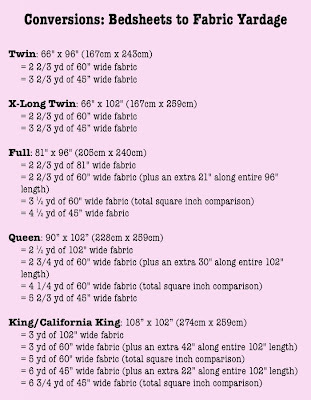 I wasn’t going to mention this, but my OCD-ness won’t let me stop typing until I do – should the Twin XL be more yardage than the regular Twin size? 2 3/4 of 60″ and 3 3/4 of 45″ maybe? Or is the 3/4 not a sewing thing? Anyway – I hope this doesn’t sound like criticism, it’s totally NOT! it really is just me trying to be helpful, and trying to learn sewing stuff!!!! So helpful! I’ve used sheets for liners inside bean bag chairs, and most recently for a crib sheet. Now I have your yardage measurements for reference. Great! Thank you! Is this conversion chart for a set of sheets? or just for a top or bottom sheet? Just a top sheet :). Thanks for this chart! I am new to quilting and needed a large quantity for the main fabric! I was hoping a twin would do the trick, but your chart showed me I needed a Queen or larger depending on the design!!! So I just Googled my question and your page popped up! I love your site for so many other things, but this came in handy at the perfect moment! Thank you again for making this conversion chart!! !